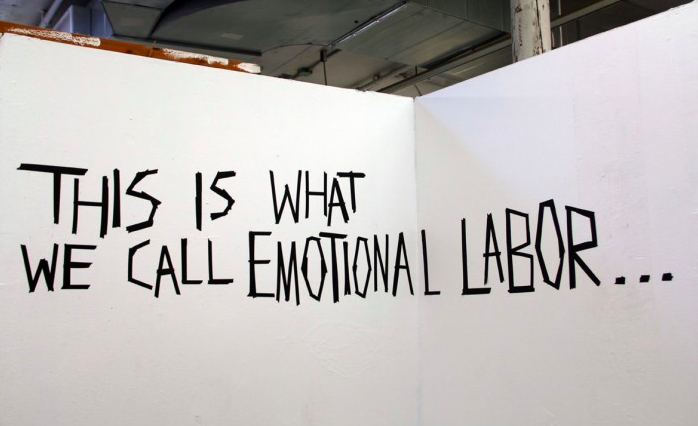 Are you doing more than your fair share of “Emotional Labor”? I listened to the associated 26 minute audio interview with Marguerite Deslauriers who is a philosophy professor and the founder of McGill’s Institute for Gender, Sexuality, and Feminist Studies. She says that when it comes to emotional labor, the stakes are high. This isn’t just about the way people interact with each other. It goes right to the heart of our very self-worth. To me emotional labor can look a bit like empathy. Marguerite goes on to say that you can ask yourself: “What’s it like to be that other person? How much do I think I understand about that person’s inner life?” And then emotional labor shows up as having the attentiveness (and expectation of that attentiveness) to ask after how that person is doing, focusing our attention on them in that moment. She goes on to say that our personal relationships are affected by this social construct. To me the social construct can certainly be expectations of women (as nurturers) versus men, but also of parents versus non-parents. The interview is mostly focused on the gender aspects between men and women when it comes to the social phenomenon of emotional labor, saying that gender roles are somewhat political as well as social. She describes that there is a “strong social expectation on women that they will be emotionally attentive to other people. And if they fail to be they are ‘bad women.’ Whereas men who fail to be emotionally attentive to other people are often classed as busy, important, or pre-occupied.” This newer term allows many of us – and many women – to see that we are experiencing heavier demands to be alert and alive to other people’s needs all of the time. This can start to feel exhausting – especially when we notice a lack of reciprocity. Girls learn very young what expectations others have of them and try to comply with these roles. If the expectation is women need to be excessively nurturing as well as we need to support and look after children and their tired parents, what happens when one needs to look after themselves in the form of radical self-care? How does it feel when a person implies that we are not adequately nurturing or doing “our part”? Ouch! Who defines that anyway? The thought of being uncaring is particularly horrible for women, and not so much for men due to these social expectations. For me with dealing with infertility and the subsequent grief, depression and identity crisis, I did not have the bandwidth at times to be emotionally attentive to other people including new parents. In that situation if we start to see signs of such expectations, we can say something like “I get that you expect me to support you emotionally, but that’s just not something I can do right now due to _______.” Also in everyday life as an infertility survivor, sometimes practicing self-care needs to take priority for our continued happy survival and wellbeing. I strive to do my best to not feel guilty or ashamed for taking care of myself in whatever form that takes. The importance of the role of parenthood is highly publicized, celebrated, and idealized – heck, we even have national holidays to point out and cheer the parents of the world. Whereas infertility is quite an invisible loss, something that is not deeply understood by others. Many don’t see the stress, grief, anger and other challenging emotions that need tending to both during and after struggling with infertility. Who takes care of us (besides ourselves and hopefully – but not always – our partners)? Here is the analysis that came after I took a quiz to get a sense of whether I’m carrying my fair share of the emotional load. “You’ve got a good balance going when it comes to emotional labor! You’re quite emotionally giving, attentive, and thoughtful… but it also doesn’t look like you’re at risk of overdoing it and taking on everybody else’s emotional burden. How very interesting. If you take the quiz, I would LOVE to see what your results were in the comments here on the blog. If you want to continue pondering this thought, try asking yourself: “Are you usually on the receiving end or the giving end of emotional labor?” And in regards to learning not to build resentment in your relationships: “Is this ‘work’ something that I need to be doing right now for this person?” How can you set up and respectfully express boundaries while not being perceived as “mean” as you do it? I hope you found this article helpful in some fashion and have perhaps learned a new term to further describe some of the challenging experiences you may be having. Know that we are always here for you at Slow Swimmers & Fried Eggs. You are not alone. Please join me next week to hear more about my personal journey down the infertility path. I look forward to speaking with you. I wish you the best on your journey. Great post, fantastic topic! I call myself a dork all of the time too, but we’re not dorks, we’re people with a life experience that has been excluded from the human conversation. So I know the thrill that tiles down my spine when I find a language connection like you did. This emotional labor is such a huge part of being child free not by choice I think – there are infinite social expectations placed on us, especially women, as far as how we relate to/support/take an interest in mothers. But there are no social expectations coming form the other direction as far as how people will honor, care for and respect us in the face of our losses and rebuilding. Sarah, you have such a beautiful way with words and stringing ideas together. I am so impressed by you. Thank you for reading, commenting, and sharing your amazing self with us here. I very much look forward to your upcoming blog post (wink, wink, there’s some encouragement to write it!). If and when you do, please feel free to post a link to your article here. And if would be so kind, please link to this article as well. Collaboration rocks and helps change the world! Much love and hugs to you, my friend. You inspire me as well. You May Like Is infertility a disease ? Life after infertility — Yes you DO matter !